A Tesla displayed at the Natick Mall. Because the carmaker has never had dealership agreements, it’s free to sell cars itself. 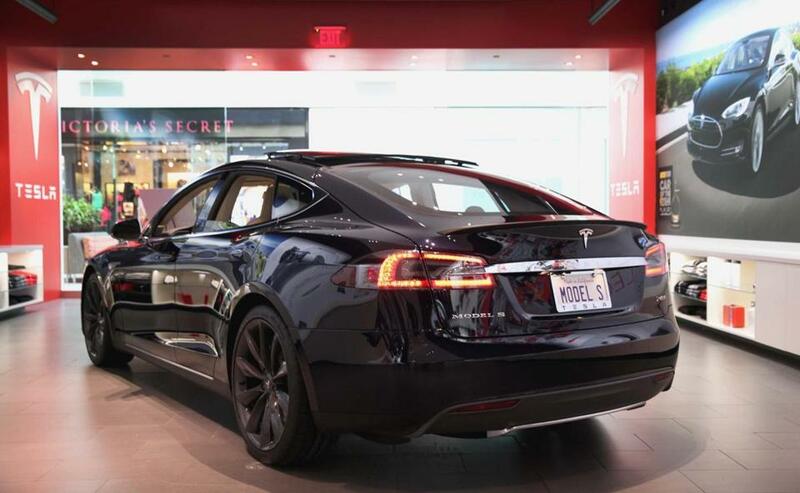 The Supreme Judicial Court said Monday that Tesla Motors Inc. can continue selling its pricey electric vehicles directly to consumers out of its showroom at the Natick Mall, next to stores that sell clothing, jewelry, and perfume. The ruling caps a nearly two-year legal battle between the California automaker and the Massachusetts State Automobile Dealers Association, which contended that Tesla’s storefront showroom violated a state law that bars manufacturers from owning and operating dealerships. But the high court said the law applies only to carmakers that already sell through independent franchise dealerships. The statute protects independent dealers that buy their inventory from manufacturers and mark up prices to make a profit; they could be harmed by competition from manufacturer-owned dealerships selling the same makes, which presumably could offer lower prices by cutting out the middleman. Because Tesla is a new entrant in the Massachusetts auto market, there are no franchisees that could be harmed by direct sales. Therefore, the court said, the dealers association, which represents more than 400 businesses, had no standing in the case. Tesla’s efforts to streamline car sales have generated mixed results so far. The company scored a similar legal victory in New York last year, struck a deal in March with the dealers association in Ohio to operate three stores, and won legislative approval in New Jersey in June. But states with more restrictive franchise laws, including Texas, Arizona and Maryland, have said the company cannot circumvent the traditional dealership system. For now, Massachusetts car buyers should not expect a significant ripple effect from Monday’s ruling, said John E. Kwoka, an economics professor at Northeastern University who submitted an unsolicited friend-of-the-court brief in support of Tesla. Major automakers like Toyota, Ford and General Motors are still prohibited from opening direct-sale dealerships because of their existing relationships with independent franchises. But Kwoka suggested Tesla’s win could pave the way for foreign carmakers with no current presence in the state to enter the market and bypass the franchise dealer system. “This means the incumbents can’t just squelch those new entrants immediately,” he said. Dealers still have one last shot to halt Tesla’s direct sales model. A bill was filed last year by state Senator Marc R. Pacheco, a Taunton Democrat, that would prohibit all carmakers — with or without independent franchisees — from owning dealerships. The bill has not advanced beyond committee. “My primary concern is about the 20,000 people who work at dealerships in our state and about the precedent this could set for imports,” Pacheco said. Prospective Tesla buyers can visit the Natick Mall to test-drive vehicles but can’t drive off the lot with a new set of wheels. Cars are custom-built and shipped from California, typically within a few months. Beyond its attempts to shake up the car-buying process, Tesla is known for making high-performance electric vehicles that look more like Jaguars than Priuses. The Model S can go from zero to 60 in six seconds and travel 200 miles on a single charge. Its price puts it in the luxury category, too — a base of about $70,000, with options that can push a well-equipped model over six figures. The company plans to begin selling an SUV, the Model X, next year at a similar price but also is targeting a 2017 release for a less expensive sedan, the Model III, which will start at around $35,000. Tesla has a small customer base — there are just 546 on the road in Massachusetts, the Registry of Motor Vehicles says — but owners are passionate. The Globe examined this issue last November. @globe.com. Follow him on Twitter @callumborchers.